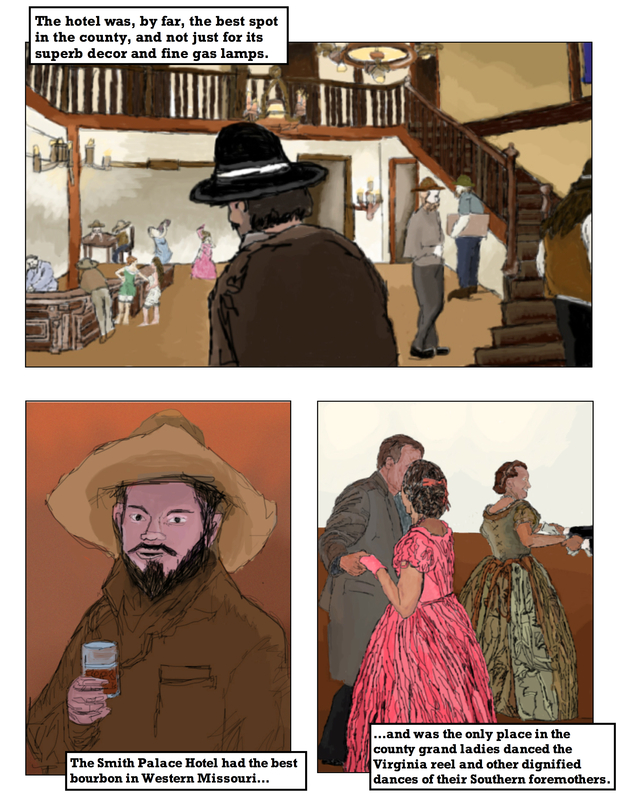 Panel 2: Caption: “The Smith Palace Hotel had the best bourbon in Western Missouri…” Close-up of the drinker, a bearded kid in floppy cowboy hat and worn, browned coat incongruous with his light, unworn, delicate skin, holding a half-full glass of bourbon. Panel 3: Caption: “…and was the only place in the county grand ladies danced the Virginia reel and other dignified dances of their Southern foremothers.” A close-proximity view of two grand ladies, bell-shaped dancing belles gliding across the hotel’s hardwood floors. One lady in a flowing cotton ball gown of numerous pinks, dancing with a man in a gray, knee-length frock-coat over a blue dress-shirt, and the lady at right dancing in a floor-length dress of fine green and orange crinoline, hand-in-hand with an off-screen male.